One of the most courageous things I've chosen to do this year would probably be to drop everything in Singapore, get on a plane, and head to the other side of the world for a couple of months. It's amazing how many things this move will be affecting though - include a complete disruption in my work, a total removal of life here for a good few months, as well as that of my braces treatment. It's amazing how putting some brackets and wire into one's mouth (along with the skill and loving hands of the good Orthoman) can really make a difference to the alignment of one's teeth! 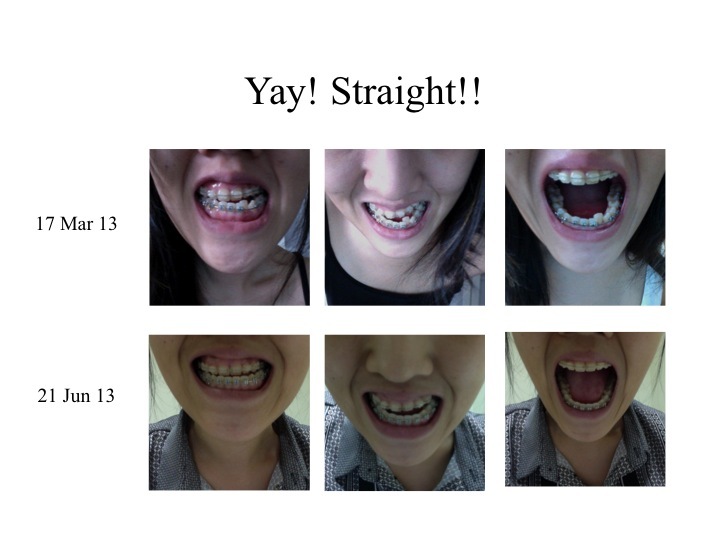 I'm amazed at how much my teeth have moved in a matter of months. 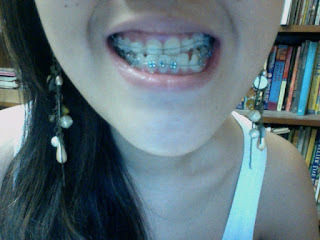 This was one of my earliest photos with the braces. Look at how bendy the wires are! And now... :) And I didn't have to use elastic bands AT ALL! I think the Orthoman freaked out a bit (in his typical nonchalant indifferent way) about my being away for 3 months and I suddenly found myself squeezing three appointments one week after another. We have one more appointment before I say goodbye till October. Okay, I think I freaked out a lot more imagining how terrible it would be if something horrible happened (a broken wire, a broken bracket, a weird turn in one of my teeth...I don't know anything is possible! Oh no! *hyperventilate*) Haha... I think Orthoman thinks I'm weird cause I'm always asking so many questions. I think he needs to learn to relax a little more though. I always feel like some perky happy ball of unicorn or something whenever I visit him cause he's a load of deadpan comparatively. It's really a little sad. Ah well, I shall do what I can before I leave. ALTHOUGH! He did laugh again at our last appointment when I honestly concernedly asked him "You will still be here right? When I get back?" Yes, anxious frown and all. I suppose dentists don't really move about as much when it comes to work. I was a little happy for him when he laughed I think.... it's like a rare sighting. Like witnessing his little dose of happy that occasionally visits him once every five years or something. Okay, I should really stop thinking so....honestly about Orthoman. 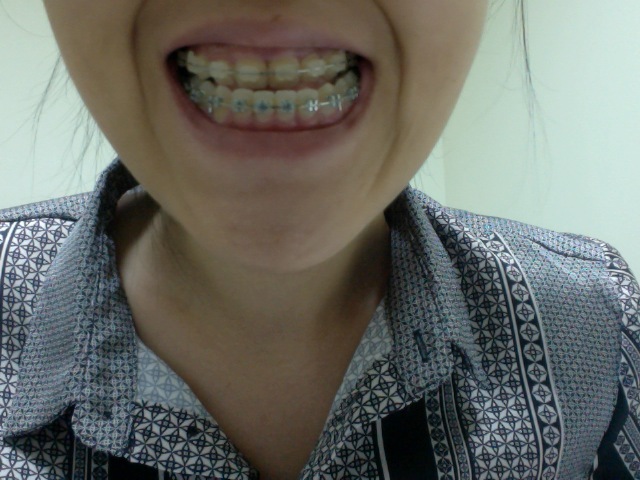 I think I have the thickest wires on both my top and bottom teeth now and I don't really feel any pain anymore like I did when we first started the treatment, so I think I'm probably pretty set for surgery soon. I'm going to ask the Orthoman that question again at our last appointment on the 2nd. Gosh, time is really passing way too fast. Are you supposed to have surgery? Yes, it'll probably be sometime late this year or next year. :) I'm excited!